Militarism is on the rise in the UK, seeping into ever more areas of life. Cadet forces in British state schools have more than doubled since 2012. The government has spent over £45 million on projects promoting a "military ethos" in schools. Armed Forces Day is now marked in communities around the UK. Members of the Army Reserve have an annual “Wear your uniform to work” day. We are encouraged to applaud soldiers as “heroes” and give to charities to support them, even as the welfare state on which wounded individuals should be able to rely is dismantled in front of us. At the Peace Pledge Union, we call this situation "everyday militarism". It's a situation in which military ideas, values and imagery find their way into more and more areas of everyday life. This is gradually becoming normal to the point where we can easily forget how distubring militarism is. Viewed at its simplest, militarism is the belief in the use of force and violence to promote and protect supposed national interest. But miltiarism goes much further than this. Militarist values affect our attitudes not only to conflict and war, but to many other aspects of power, politics and everyday life. The first claim of militarism is that violence solves conflict. However, conflict happens all the time: whenever two or more people have incompatible aims. The vast majority of conflicts do not involve violence. Many people want to resolve conflicts peacefully. However, keeping violence in the background as a “last resort” often means that nonviolent options are not thoroughly explored. The Peace Pledge Union does not avoid conflict. 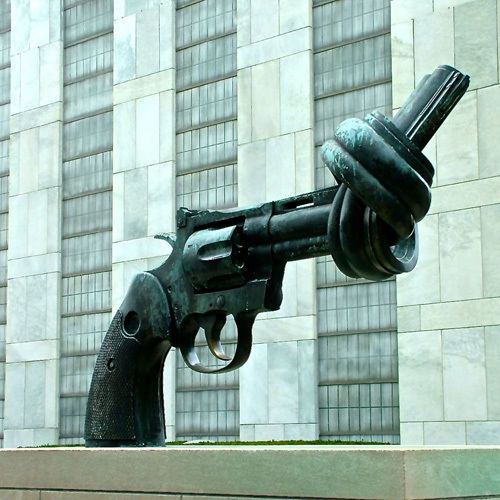 To be a pacifist is to be in conflict with society’s dominant values. Pacifists want to resolve conflict without violence. War inevitably leads to innocent people suffering. And while violence can destroy the hater, it takes much more to destroy the hate. A second aspect of militarism is the notion that unquestioning obedience is something to be admired. 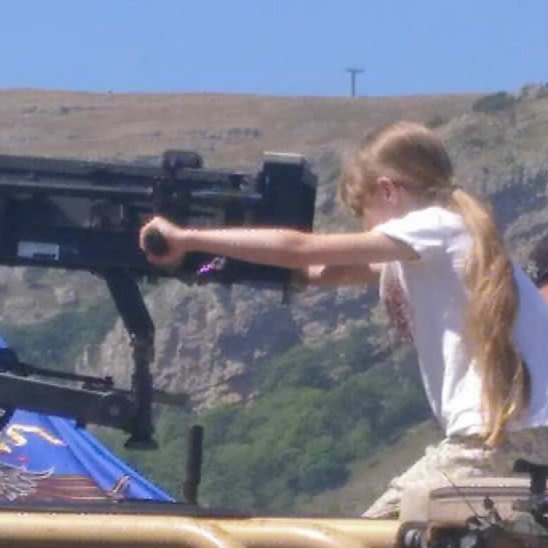 Militarism has a corrosive effect on the ability of both children and adults to think for themselves and speak out when they see something wrong. Armies require people to obey orders without question. Of all the reasons that might be given for killing a human being, surely the very weakest explanation is that you killed because someone told you to. Nationalism is another aspect of mlitiarism. We are urged to “defend our country” without any discussion of what we even mean by a “country”. Talk of the “national interest” implies that everyone in the UK has the same interests. In reality, it usually means the interests of those with wealth and power. Fighting for a country usually means fighting for its leaders. Militarism diverts our attention away from the underlying causes of war and injustice. The 21st century has seen a decline in enthusiasm for war amongst the British public, yet at the same time militarism is on the rise. These two developments are connected. Public support for war has been drastically reduced by the death, waste and lies of the wars in Iraq and Afghanistan. Faced with a lack of support for military conflict, the establishment focuses instead on celebrating the armed forces. 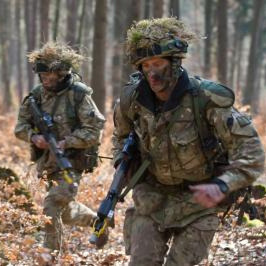 Initiatives such as Armed Forces Day and the Cadet Expansion Programme form part of a steady militarisation of British society that has paradoxically developed at the same time as public enthusiasm for war has declined. Examples of everyday militarism range from military visits to schools to the Invictus Games, from recruitment leaflets in cafes to deals with local authorities to grant privileges to military employers. Armed Forces Day was introduced in the UK in 2009, in the wake of widespread public opposition to the wars in Iraq and Afghanistan. Hundreds of events are held around the UK on Armed Forces Day - the last Saturday in June - or on nearby days. They are designed to promote a positive image of the armed forces, while also acting as recruitment tool. By promoting “respect” for the armed forces, events such as Armed Forces Day encourage support for war by the back door. They normalise and encourage violence, nationalism and unquestioning obedience. Thankfully, there have been protests against Armed Forces Day ever since it began. In 2018, there were protests and alternative events in more places than in any previous year. Resistance to Armed Forces Day can be effective. In 2017, Glasgow City Council cancelled a so-called “Armed Forces Fun Day” following local protests. In 2018, the Mayor of Leicester backed calls by Leicester Against War for a ban on armed forces' inviting people under 16 to handle weapons. Local communities have been further miltiarised by so-called "military covenants", which have now been signed by every local council in England, Scotland and Wales. These commit councils to policies that support the armed forces and facilitiate their activities. They are based on the myth that there has always existed a "covenant" between the armed forces and the country as a whole. Some councils have gone so far as to subsidise military recruitment. In 2016, PPU member Ed Bridges, then a councillor on Cardiff City Council, discovered that the Council was not charging the armed forces for recruitment stalls on council property, when other employers were expected to pay. The PPU is supporting people around the UK in challenging everyday militarism in their own communities. You can read more about militarism in local communities and how people are resisting it. If you would like support in challenging miltiarism in your own community, please email us at mail@ppu.org.uk or drop us a quick message. In recent years, there has been a sharp rise in military involvement with school education in Britain. Since 2012, the UK government has spent over £45 million on projects operating with a "military ethos" in schools in England. These include the use of outside companies such as Commando Joe's and the UK Mliitary School, often staffed by ex-forces personnel, to run programmes in schools. In the same year, ministers launched the Cadet Expansion Programme and by 2016 the number of state school cadet forces in the UK as a whole had more than doubled. In 2015, the government promised an extra £50million to increase the number of such forces to 500 by 2020. Mliitary visits to schools have also risen, with schools in poorer areas much more likely to be targeted. The armed forces like to say that such activities are not about recruitment, but the Ministry of "Defence" gave the truth away in their Youth Engagement Review in 2011. They stated outright that the armed forces' engagment with young people should lead to two outcomes: "An awareness of the armed forces' role in the world... in order to ensure the continued support of the population; and recruitment of the young men and women that are key to future sustainment and success." The Peace Pledge Union believes that young people should be able to hear a range of views on war, peace and armed forces, including learning about alternatives to armed force. You can read more about militarism in schools and the campaigns to challenge it. If you're a school student, teacher or parent, and would like support in challenging militarism in schools, please email us at mail@ppu.org.uk or drop us a quick message. There are two types of military recruitment going on in British universities. One is the physical recruitment of people's bodies into the armed forces. The second is the recruitment of a much larger number of minds to believe that miltarism is acceptable and that the armed forces are unquestionably beneficial. The University Officer Training Corps (UOTC) are explicit in saying that one of their aims is to ensure that graduates who go on to work in business or politics are "minded to act as positive advocates for the army". In addition to the UOTC and similar organisations, the armed forces themselves often run recruitment stands at events such as university recruitment fairs and freshers' fairs. The same is true of arms companies, which have been met by large numbers of student protests in recent years. The Peace Pledge Union supports students campaigning against the presence of armed forces and arms companies at universities. If you're campaigning against miltiarism in your own university, or want support or advice in doing so, please drop us a line at mail@ppu.org.uk or send us a quick message. After World War One, regular ceremonies and other events were organised to remember those who had died. They frequently used the phrase "never again" in regards to the war. Now, Remembrance is misused to promote the armed forces rather than to recognise the horrors of war and learn from the past. The Royal British Legion, who produce red poppies, say that only members of UK and allied armed forces should be commemorated on Remembrance Sunday, not civilian victims of war or those of other nationalities. In contrast, the Peace Pledge Union calls for a return to the message of "never again". 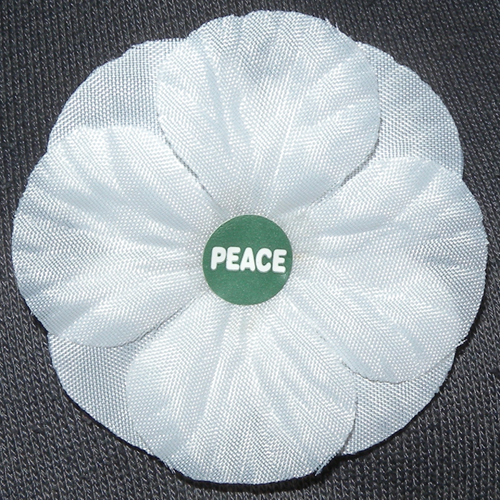 We produce white poppies, which represent remembrance for all victims of war, a commitment to peace and a rejection of militarism. 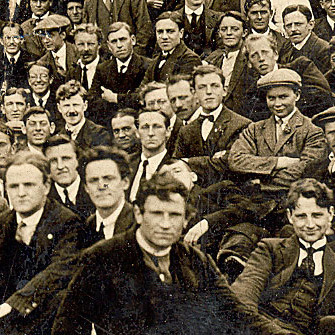 Read more about Remembrance and the need to link it with peace, not miltarism. It is said that in a democracy the armed forces simply follow the wishes of an elected government. This has never been the case: the armed forces' leadership exercised influence over UK government policy in both world wars. However, there is evidence that the situation has got worse in recent years. The Chilcot Report on the UK's involvement in the Iraq war noted that the army leadership had lobbied Tony Blair to deploy a greater number of British soldiers to Iraq than he was originally minded to do. Professor Paul Dixon points to several further examples of military influence in his recent report Warrior Nation: War, militarisation and British democracy. In 2006, the head of the British army, Richard Dannatt broke the longstanding convention that the military leadership should not criticise the government in public, when he gave an interview to the Daily Mail in which he attacked the government's foreign policies. In 2015, an anonymous general effectively threatened a military coup if Jeremy Corbyn were to become Prime Minister. When an organisation rooted in violence, hierarchy and obedience seeks to exert influence in these ways, democracy itself is threatened. Militarism and human rights are not compatible. But in recent years, the armed forces in the UK have sought to present themselves as supporters of women's rights, LGBT rights and equality. Such principles are, however, contrary to the very nature of the armed forces. The armed forces involve rigid hierarchical structures in which their members are required to obey orders, even orders to kill, without reference to their own conscience. They deny the human rights not only of the people who they harm and kill but of their own members, who are not allowed to speak in public without permission, to join trades unions or to campaign for improved conditions. In 2017 and 2018, the armed forces stepped up their effort to present themselves as supportive of women's rights and the rights of LGBT+ people. They produced an online advert called "Can I be gay in the army?". They are also attending LGBT Pride events to promote their image and in some cases to run recruitment stalls. This has nothing to do with equality and human rights. It is due to the armed forces' ongoing recruitment crisis and an attempt to improve their image by "pinkwashing" it. In 2016, the Peace Pledge Union joined with LGBT+ campaigners and other peace groups to launch No Pride in War, a broad-based campaign calling on LGBT+ movements to reject the armed forces' attempts to co-opt them. If you're challenging militarism in LGBT+ or feminist movements, or would like support in doing so, please email us at mail@ppu.org.uk or drop us a quick message. Are you challenging everyday militarism in your community, workplace, school or university? Would you like to? Action at a local level can be effective. In 2017, Glasgow City Council cancelled a so-called "Armed Forces Fun Day" after a campaign by local members of the Peace Pledge Union and Scotland Against Militarism. 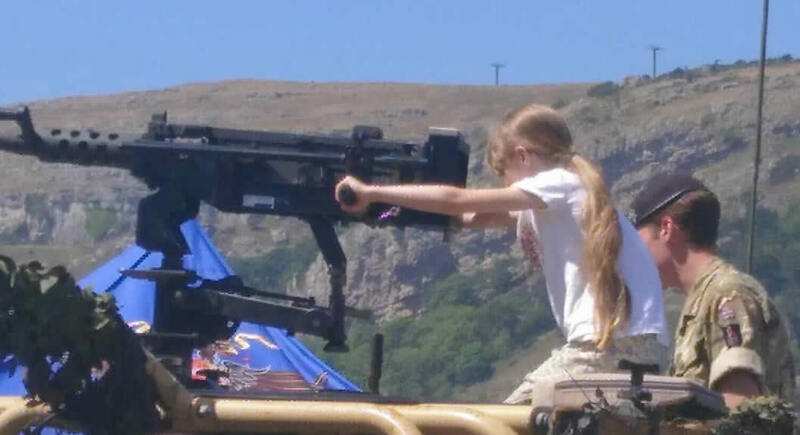 In 2018, the Mayor of Leicester agreed to prevent the armed forces from inviting children to handle weapons at recruitment stalls. In Wales, several schools have committed themselves to providing education on peaceful conflict resolution following work by Wales for Peace. If you would like the PPU's support or advice in campaigning in your own community or context, please feel free to email us at mail@ppu.org.uk, to phone us on 020 7424 9444 or to send us a quick message.